Adult, Kern Plateau, Kern County. 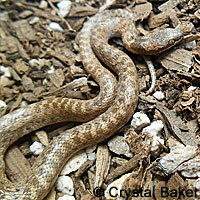 A Northern Desert Nightsnake crawls across an old cement highway into the desert. 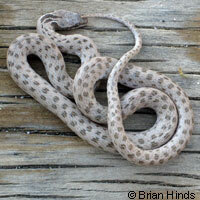 Not Dangerous (Non-poisonous) - Mildly venomous, but not considered harmful to most humans. Adults can be 12 - 26 inches long (30-66 cm.) Most seen are 8 - 12 inches long, rarely over 16 inches. Hatchlings are about 7 inches in length. 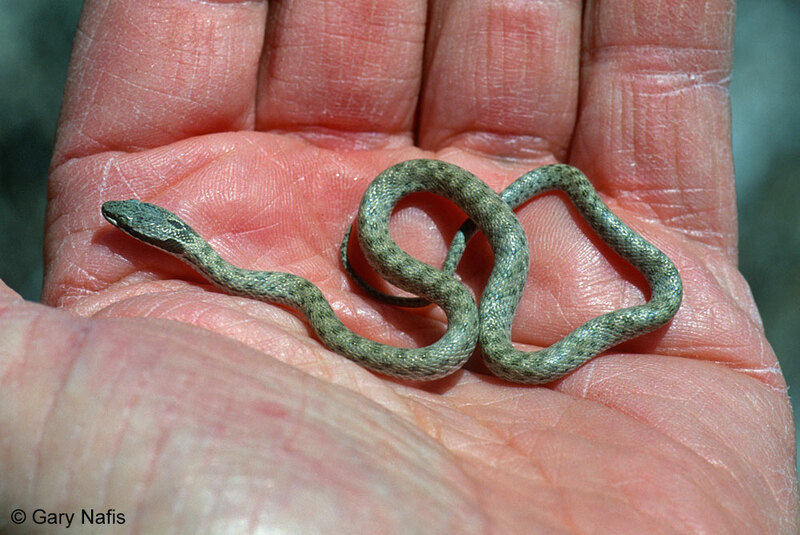 A small slender snake with a narrow flat head, smooth scales in 21 rows, and vertical pupils. Color varies, often matching the substrate, from light gray, light brown, beige, to tan or cream, with dark brown or gray blotches on the back and sides. Usually a pair of large dark markings on the neck and a dark bar through or behind the eyes. Whitish or yellowish and unmarked underneath. 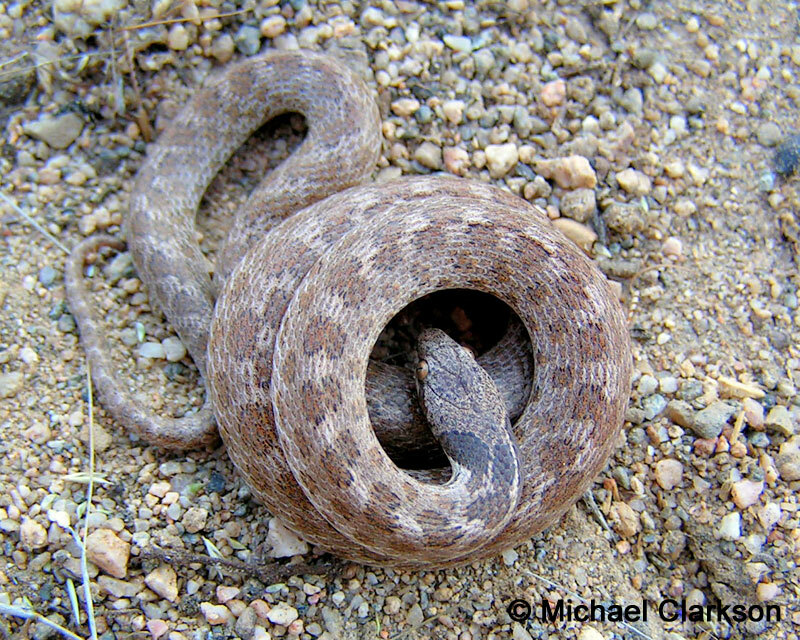 gophersnakes and other similar species which have circular pupils. Nocturnal, and also active at dusk and dawn. 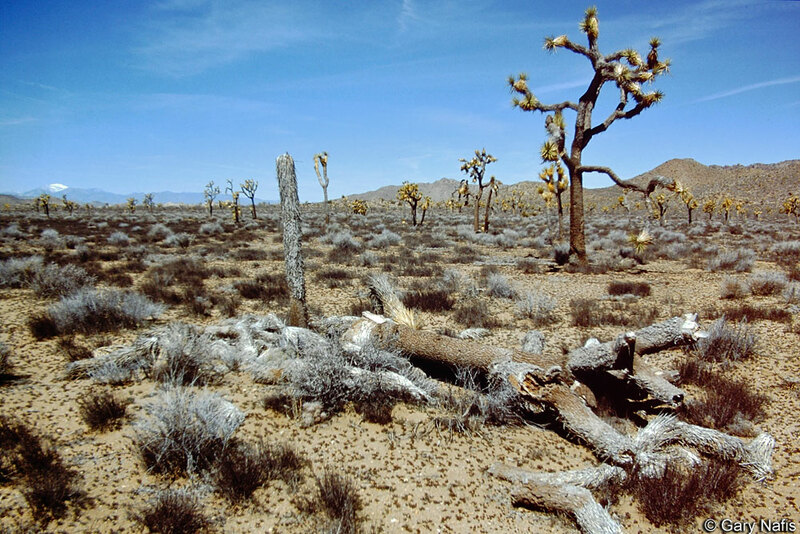 Can be found under rocks, boards, dead Joshua tree branches, and other surface objects. Often seen crossing desert roads on warm nights. Eats a wide range of terrestrial vertebrates, mostly lizards and their eggs, sometimes small snakes, frogs, and salamanders. 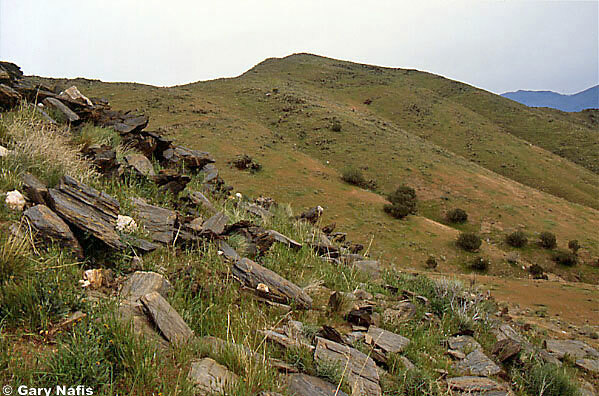 Found in a variety of habitats, often arid areas, from chaparral, Sagebrush flats, deserts, suburban lots and gardens, mountain meadows, grassland. Most commonly found in areas with abundant surface cover. 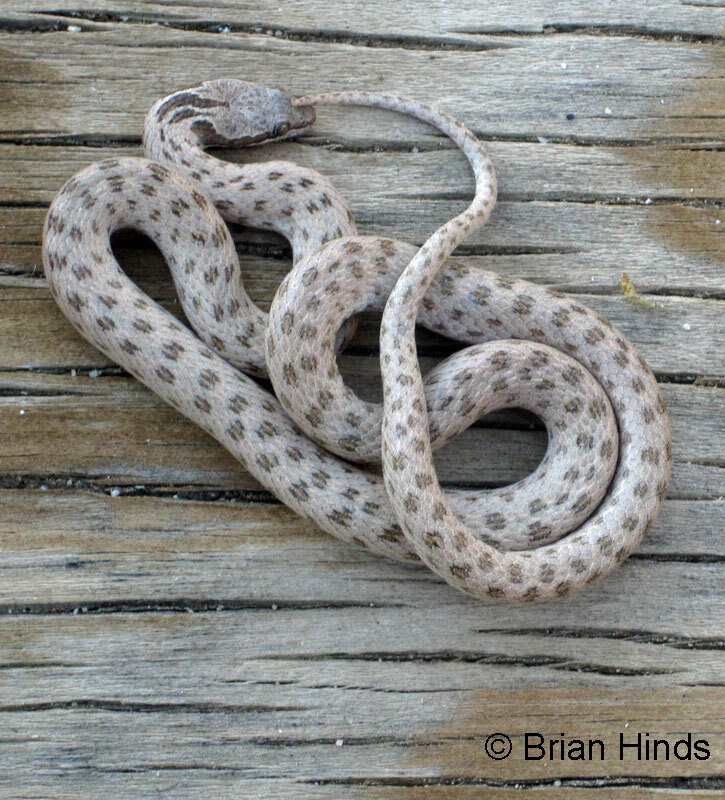 This subspecies, Hypsiglena chlorophaea deserticola - Northern Desert Nightsnake, is found throughout southern California, north to San Luis Obispo County, east and north along the western Sierra Nevada mountains, and into the Great Basin desert in the far northeast part of California, including Lava Beds National Monument. There is also a record for Siskiyou county north of Yreka near the Oregon Border. Outside of California, it ranges south into Baja California, east throughout the southwest, and north into Washington. 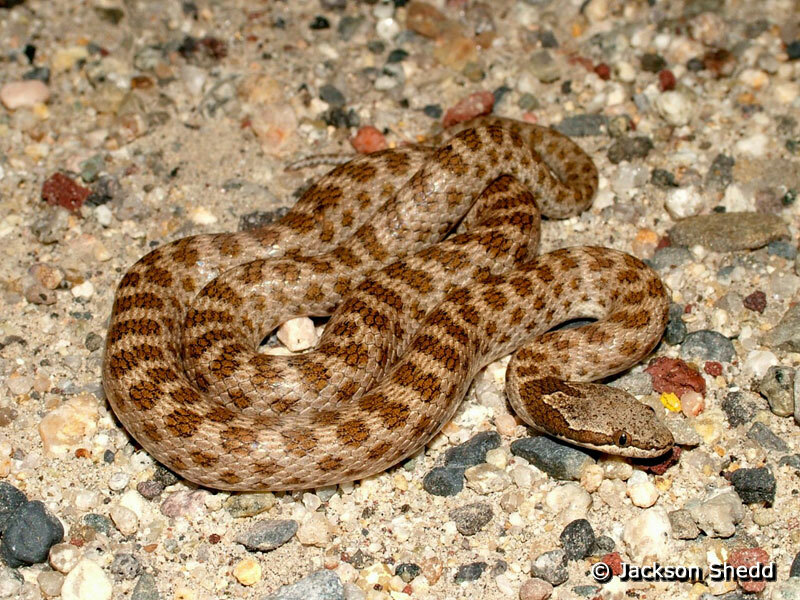 Outside of Califorina, the species, Hypsiglena chlorophaea - Desert Nightsnake, occurs from British Columbia south through central Washington, eastern Oregon, southwest Idaho, Nevada, Utah, extreme western Colorado and New Mexico, into Arizona, Baja Califonria, And Sonora, Mexico. Sea level to 8,700 ft. (2,650 meters). Grismer et al. (1994 Bulletin of the Southern California Academy of Science 93(2): 45-80) synonymized the Hypsiglena torquata subspecies deserticola and klauberi because they intergraded widely. 1 Daniel G. Mulcahy. 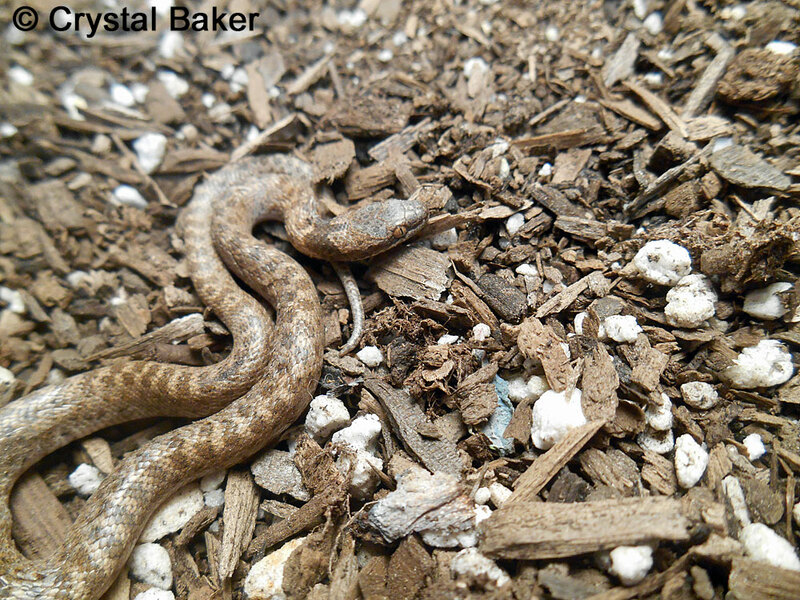 Phylogeography and species boundaries of the western North American Night snake (Hypsiglena torquata): Revisiting the subspecies concept. ScienceDirect - Molecular Phylogenetics and Evolution 46 (2008) 1095-1115.